Staff at Weydon take groups of students on an incredibly wide variety of visits and the school wants to encourage these activities. We are sometimes reminded through events reported in the news that there are risks involved in such visits. Determined not to lose this precious aspect of education at Weydon, the school has to be very careful to avoid significant risks and manage any remaining smaller ones while we are in loco parentis. To do this we follow strictly the County’s guidelines which involve risk assessment and expert review as necessary in the approval cycle for visits. Even when there are expert trainers or instructors (whose qualifications are always checked) on a visit, we retain the responsibility to overview activities and stop them, just like a good parent would, if we felt that the bounds of acceptable safety parameters were being reached. The school tries to make visits as widely available to all students as possible, but must be allowed to judge on whether it is right to take individual students. student subsequently gives us a reason for concern about their behaviour, we reserve the right to withdraw the student from the visit. Parents should be aware that in these cases they will not be covered by the insurance and if the incident happens after payment has been made the school will not be in a position to refund the money. 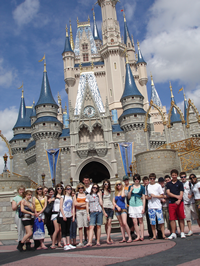 The school has a visits policy which sets out the procedures for visit leaders in more detail. The school follows the Surrey County guidelines about the organisation and running of visits. This involves the process of recorded risk assessment by the visit leader on each occasion, with appropriate levels of checking and approval and the appointment of home/school contacts. The process is documented in the guidelines but additional checks are made by the Headteacher (who approves every visit) into such aspects as levels of staffing, qualifications of teachers and specialist staff, information to parents and organisation of home contacts, Duty Officers etc. Teachers run journeys and visits abroad using the services of various companies which provide travel for schools. These are always checked with Surrey County Council and are likely to be known by the Consultant for Outdoor Education. Where a new company is used, the operating procedures or code of practice will be checked as appropriate. Teachers will usually conduct a meeting for parents before major visits to give detailed information about the visit and to give parents the opportunity to ask questions. The school aims to provide as wide a range of opportunities as possible within the good will of the staff who give up their free time to provide this service. There will be a closing date & time for all applications/monies to be returned to school for each visit. The closing date will be at least 3 school days before the visit is to take place. Should the visit be oversubscribed then a lottery draw will take place in front of students. Staff will normally give 4-5 days’ notice for deposits/payments to give parents an opportunity to talk to staff and gain any further information they require. In order to complete Health & Safety procedures all monies must be paid by the closing date. Payments should be made by WisePay via the school website. If you need a reminder of your log-in details then please e-mail finance@weydonschool.surrey.sch.uk . Any money received after that date may jeopardise the student going on the trip. No students will be accepted onto a visit after the closing date. Parents will be given details of travel insurance before the journey takes place as necessary. The acceptance of students on journeys will depend on their behaviour both in and out of school. If a student’s behaviour was such that we did not feel that we could be confident about their (or other people’s) health and safety we would discuss this with the parent but would reserve the right not to include the student once we had explored all avenues. In such a case, especially when the school had already paid for the visit in full, the school journey insurance might not cover any payment made and, unless a replacement could be found, the school would not be able to refund any payments made. Parents are expected to phone the office if their son/daughter is going to be absent for the visit. Please see below a list of the international school visits that the school currently run. This is intended as a guide to give you an idea of the vast range of trips that are available to each year group. There is no guarantee that the same visits will take place in the future. There are many factors that will affect trips and the cost of them such as staff availability / willingness, viable numbers of students wishing to attend, foreign exchange rates, inflation, government school funding, fuel costs, etc. therefore the above is intended to be used as a guide only and is subject to change and/or amendment at any time.